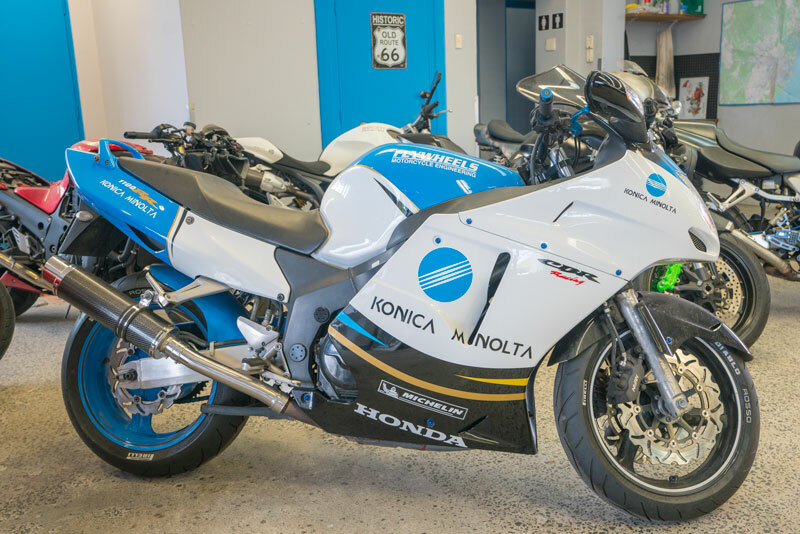 Do you need your motorcycle repaired? You’re at the right place. Flywheels is the place that people (even dealers and other workshops) go to when they get stuck troubleshooting problems. We find it, fix it and enjoy it. 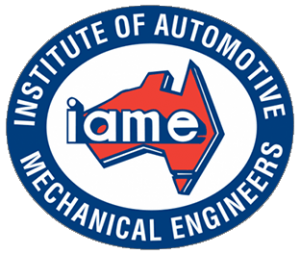 We service all the major OEM brands from Europe and Japan, including Yamaha, Honda, Kawasaki, Suzuki, BMW, Ducati, Aprilia and Triumph motorcycles. No problem is too big or too small for us; we can tackle any problem from a broken blinker to a broken crankshaft. We are able to complete factory scheduled service and maintenance. 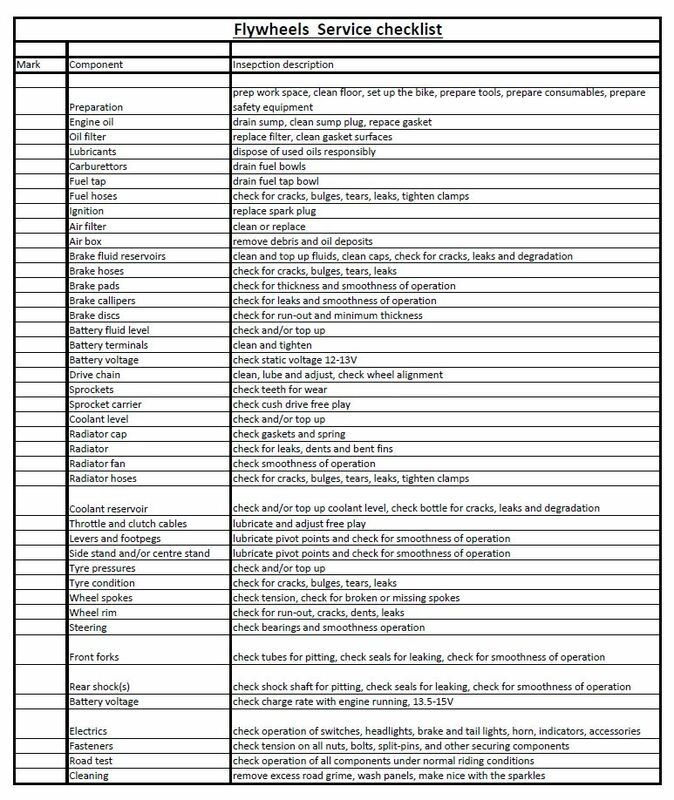 And if you’re going off the book we have a massive check list to stick to when we do any kind of service depending on your bike’s mileage. From minor services to major services we can do all the good stuff. 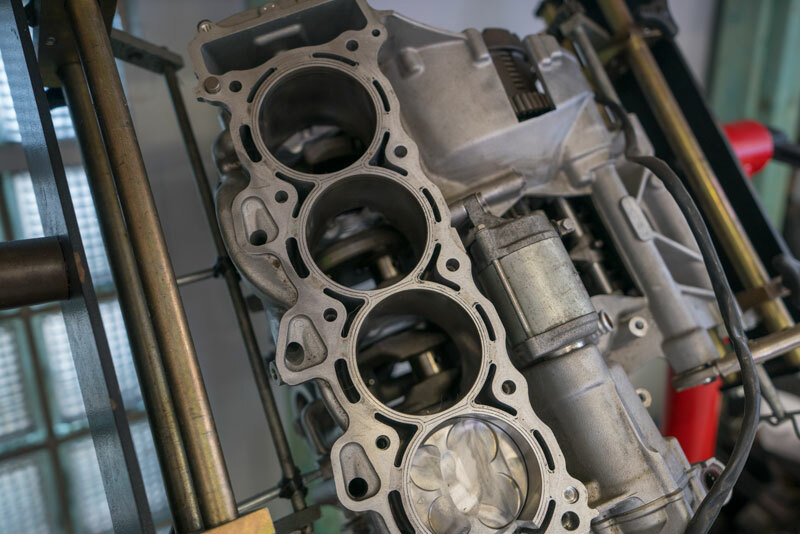 On every oil change we flush the engine with conditioner before the oil gets dumped to make sure we get every last bit of sludge out of the little galleries and internal orifices, this rejuvenates the lubrication system, making the engine run cleaner, cooler, and smoother. 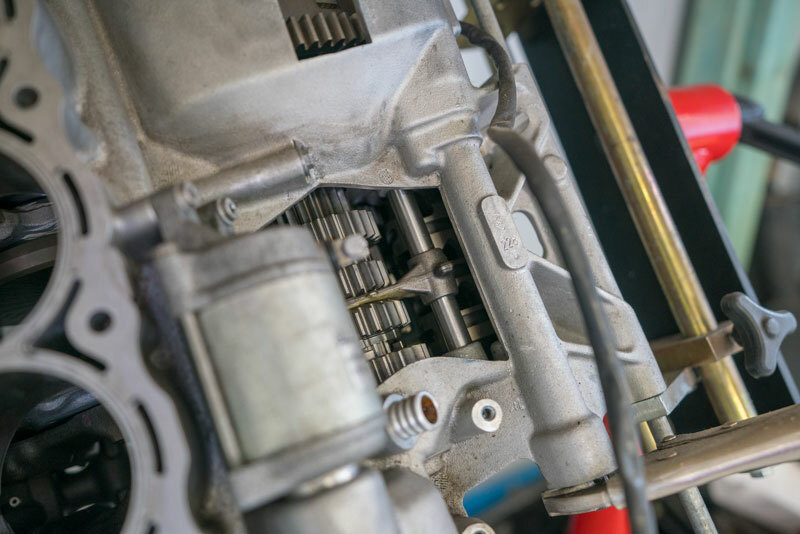 Chains get cleaned, lubed, adjusted & aligned, hydraulics get flushed, injectors get cleaned, throttle bodies get balanced, fasteners get torqued, and for those who are concerned about modern computer-controlled bikes… we have the software. Clearing service codes, resetting throttle position sensors, running diagnostics, self-adaptive parameters, are all part of the service. Is it that time of year again already? 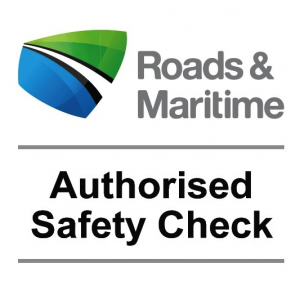 Don’t worry, we make it easy and painless, offering everything you need to keep your bike on the road, safe and legal. Or maybe you’re pulling your bike out of mothballs and need to blow off the cobwebs to keep the RMS happy? We can do it all. A pink slip is for bikes over five years old, specifically for if your registration is about to expire, or has recently expired. The registration inspection takes less than 5 mins, so you can wait around. 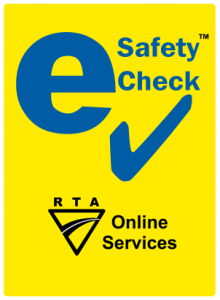 We conduct these digitally, so you can register your bike almost immediately on your phone; no mess, no fuss. Prices start at $23, or come free with any service. If your bike has been out of registration for more than 3 months, this is the one you need. It’s a little bit more involved with the paperwork, but it’s still no problem for us. We can even install your new number plate. Is it complicated enough for you yet? We try to make it simple. You just need to answer a few questions about the vehicle identifiers, and your address and birthday and driving record; after that we can do everything over the phone. You don’t even need to come in for this one, I can even give you a quote over the phone. Pay by credit card and you’ll receive your CTP by email, ready for registration. Don’t worry it happens to everyone! As long as you’re OK, that’s the main thing. We will handle the rest. Just let us know what happened, make your claim, and we will take it from there. From start to finish we will handle everything. We can even arrange transport if necessary. 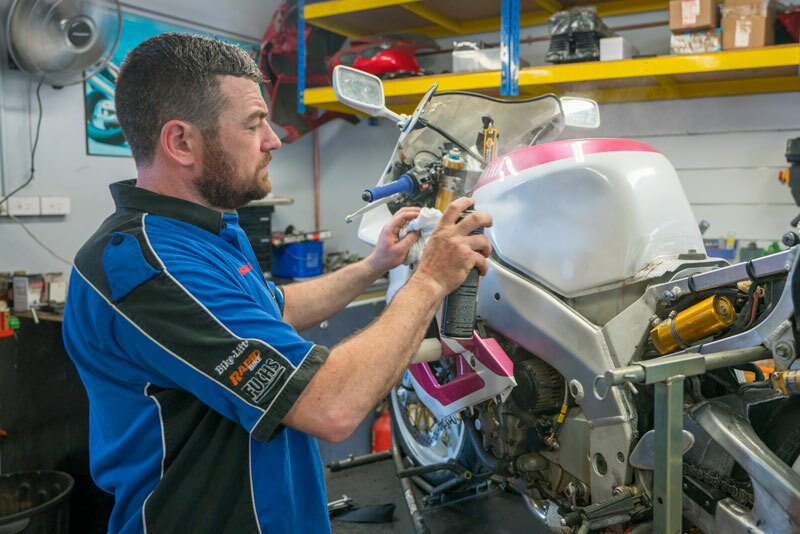 We quote, we liaise with your insurance company, we supply parts, and we get the bike back to a better condition than it was in before the unthinkable happened. And don’t forget, you’ll even get a free service while the bike is being repaired! If you have a Kawasaki, your bike will be repaired with Genuine OEM Kawasaki Parts. If you have a Ducati, your bike will be repaired with Genuine OEM Ducati Parts. Only the right stuff is used for our customers’ pride and joy. But if you would like an exception, maybe something changed in the process, just have a chat with us, we will walk you through all the options. If the accident was not your fault and the other party has made an insurance claim, we can show you how to get a free loan bike for the entire period of the repair job. Easy, just ask us how. When it’s all said and done, we will return your bike, fully repaired, thoroughly serviced, AND fully detailed. It’s just what we do. 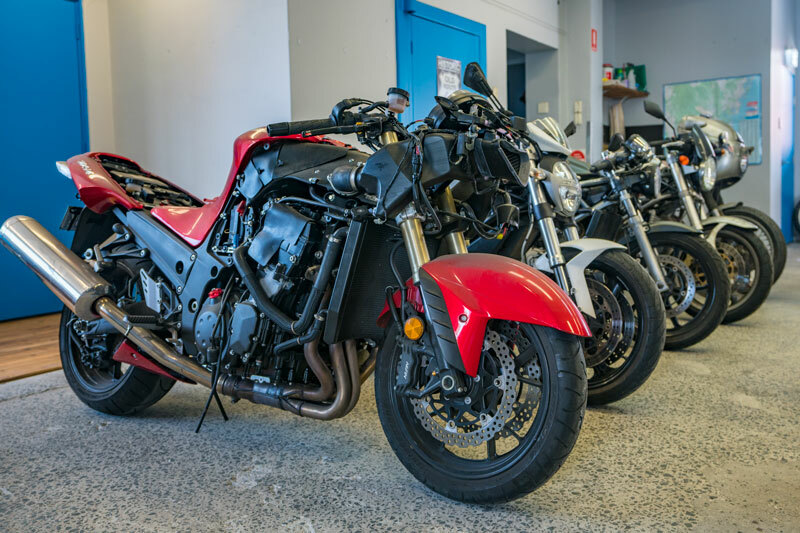 We have been in the business of providing quality motorcycle parts and accessories since 2004 and also see to it that any part purchased from our place gets properly installed by an expert and experienced mechanic. Found something cheaper on the internet? No problem, bring it in and we’ll fit it for you. 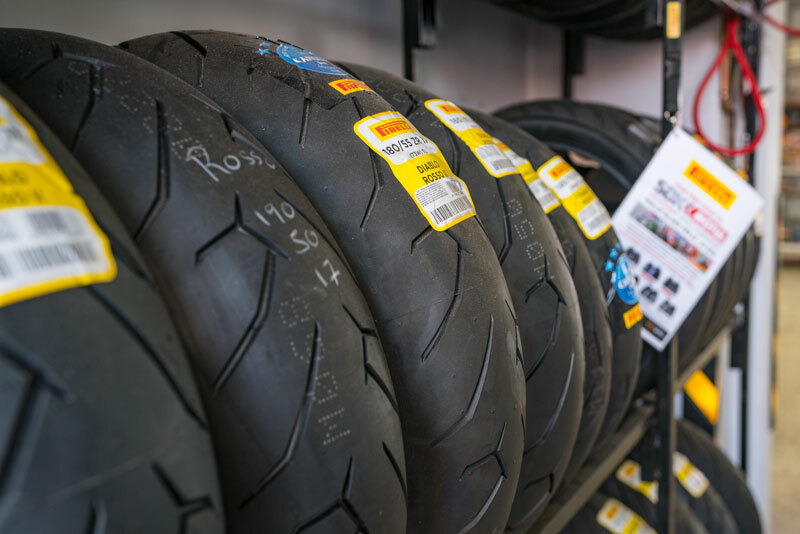 Our reputation and long service has made it possible for us to gain a lot of recognition from some of the best stockists around including the likes of Pirelli, Motul, Motorex, Akrapovic, K&N, Oggy, Ventura, Dririder and NGK among others. Being in business with these very reputable companies make it possible for us to always have the best motorcycle parts and accessories available for each and every one of our customers. 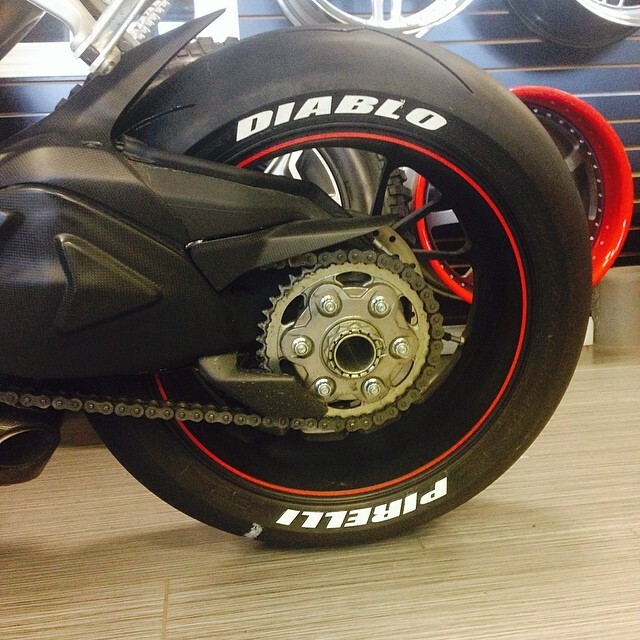 We stock the full Pirelli range in store, including the flagships Diablo Rosso and Angel GT. We can also supply Michelin and Bridgestones if you prefer. Or you can try Shinko for a cheaper alternative. If you want a better sound from your machine and some more grunt at the same time, we got you covered. 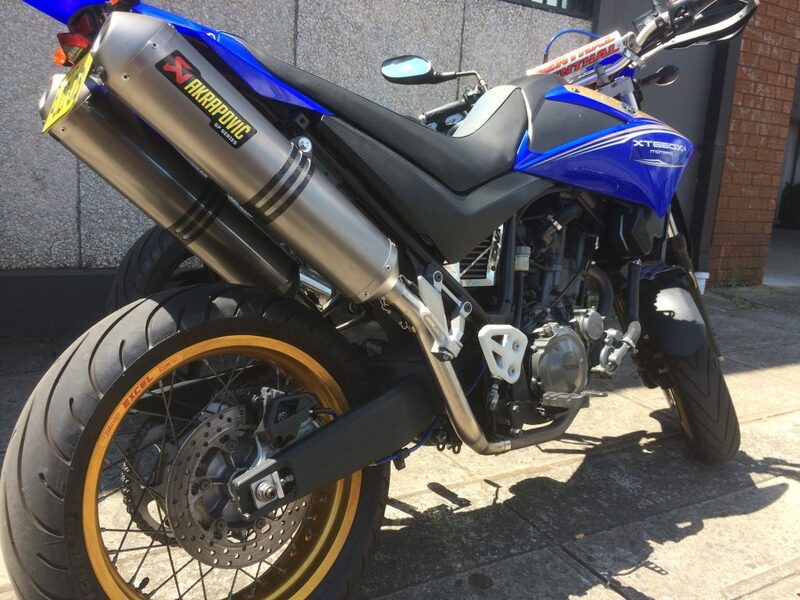 We can supply a wide range of exhausts to suit your style. Carbon, Titanium, Aluminium, Akrapovic, Leo Vince, Arrow, it’s all good. And don’t forget the High flow air filters by K&N, BMC, DNA. You want it, we can get it. For when the unthinkable happens. Cheap insurance policies that protect your bike and add to it’s styling at the same time. Oggy Knobs provide fantastic protection for a bike’s frame, forks and swingarm, while R&G provide full kits to take care of the bike’s sensitive engine covers. We can help you make your pride and joy stand out from the crowd. Anything thing you do to your bike makes it unique, and we want to be a part of that. Braided brake lines (in any colour), wheel stripes, adjustable levers, instruments, exhaust, air filters, wave discs, super sprockets, grippier grips, coloured chains, LED lights, blinkers, and anything else you want. We can do it all. When the unthinkable happens in the form of a little angry man with a hammer inside your engine trying get out, we spring into action with a proper tear down diagnostic. We love building engines. And we can make them better, faster and stronger. We have the technology. At Flywheels we offer everything your engine needs to roar back into life. If you need your valve clearances adjusted as part of a normal service, no problem. 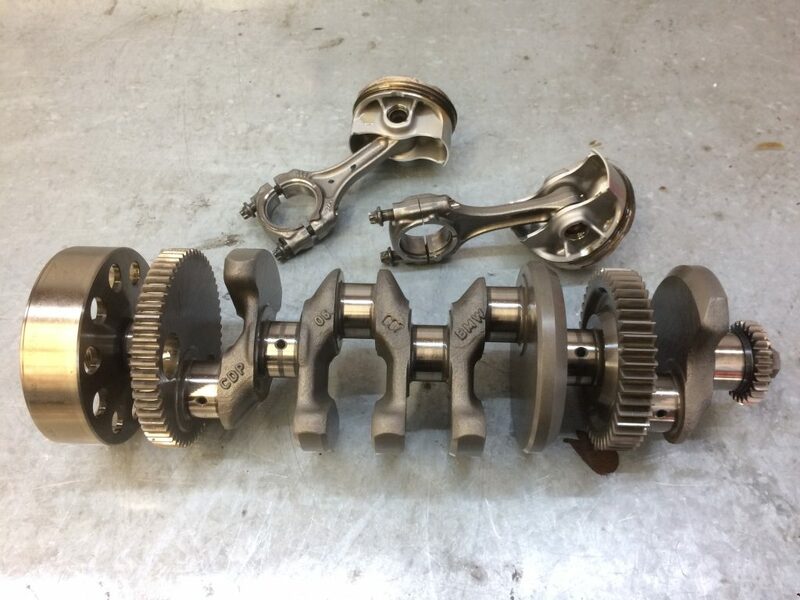 If you need a conrod replaced after a weekend at the track, no problem. Top-end rebuilds are all the rage at Flywheels. 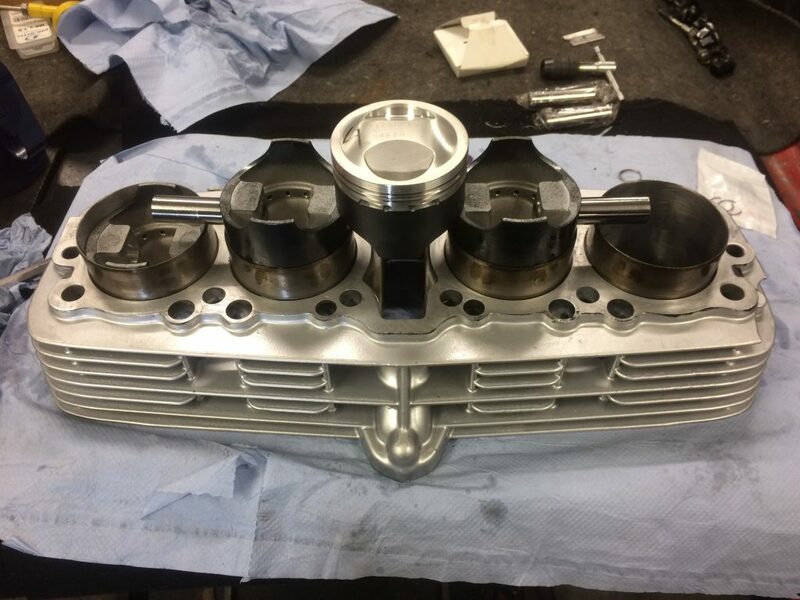 Decoking combustion chambers, decking head surfaces for more compression, refacing valves, 3-angle cuts on valve seats, porting and polishing, and more. We can supply and install big bore kits to unleash some hidden horsepower. We get all our piston skirts Teflon coated to reduce friction and can also do ceramic coating on the crowns too. When the big-end bearings come knocking, Flywheels answers the call. 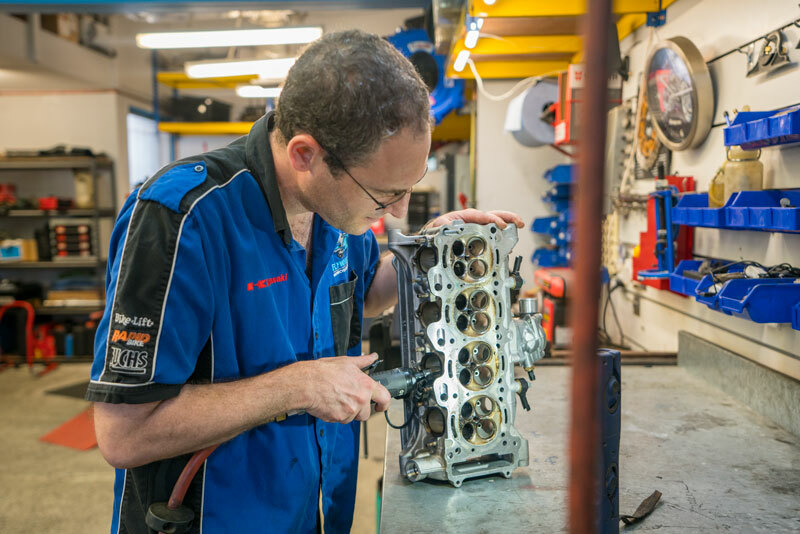 Full engine rebuilds are what we do best. 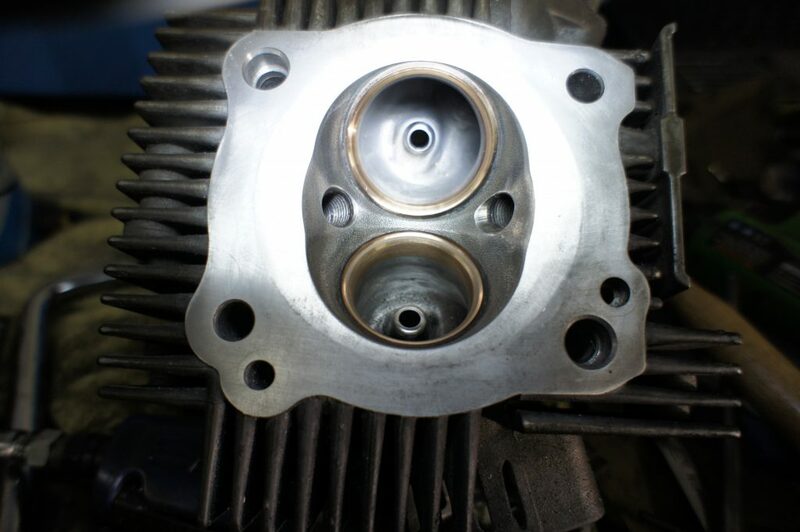 We can supply gasket kits, crank and conrod bearings, all fitted correctly. Basket cases? No problem. If you’ve started pulling apart your engine and need to put it in the “too hard basket”, we love that basket. If you have your engine apart, you might consider under-cutting your gearbox for that extra positive gear selection. 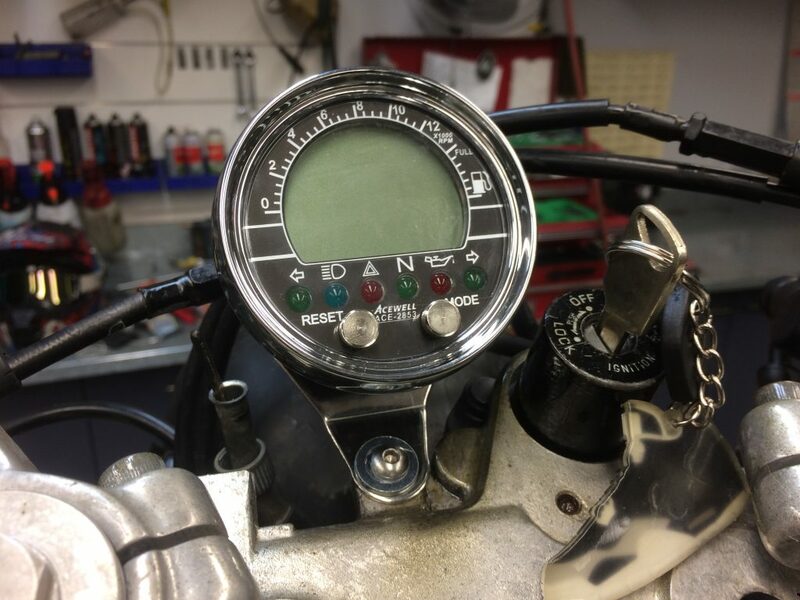 We can also install a quickshifter for that race-feel full throttle clutchless shifting. Or maybe you just need to change your final drive gear ratio for cheap “bolt-on” horsepower. This is where we shine. Do you want to make your bike unique? Are you stuck with a stock bike, while dreaming about owning a café racer? Do you want your bike to stand out from the stock crowd? We can do it all and more! From complete restorations, to streetfighter conversions, to adapting a race spec swingarm to a production frame. If you have an idea to improve your bike, Flywheels will make it happen, and make it look like it was supposed to be that way from factory. Colour is important! A single tone can make or break a bike’s aesthetic. Custom decals are not a problem. If you’re on a budget, we can even find a replacement body kit to suit your taste. From day-glo Purple to Matt Black, whatever your style, let us bring it to life. 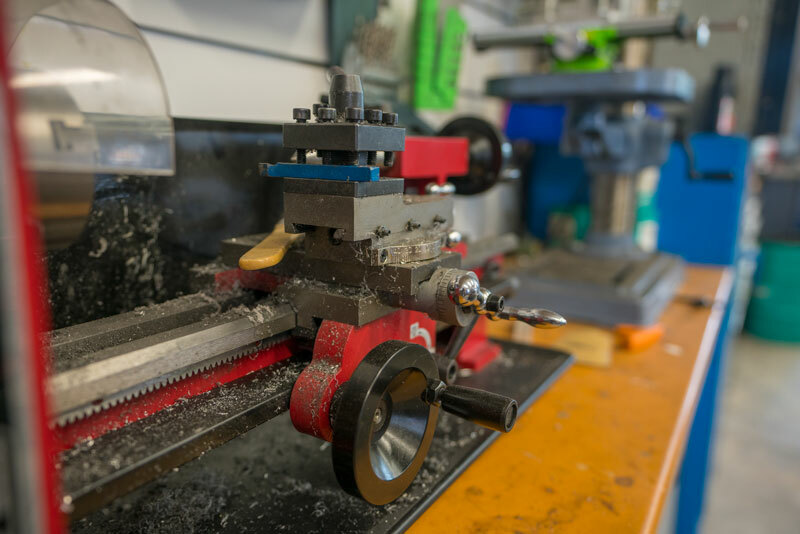 Our Techies have the use of a fully equipped engineering bay right in our own workshop. Frame modifications don’t scare us. From removing unwanted brackets and cleaning up factory welds, to chopping subframes and adapting integrated taillights right into the stock frame, Flywheels transforms bikes right down to the back bone. Do you want a digital dash? Or some new wheels? Maybe a flat handlebar with risers on your sports bike? What about a new seat trim for your classic with piping and stitching? 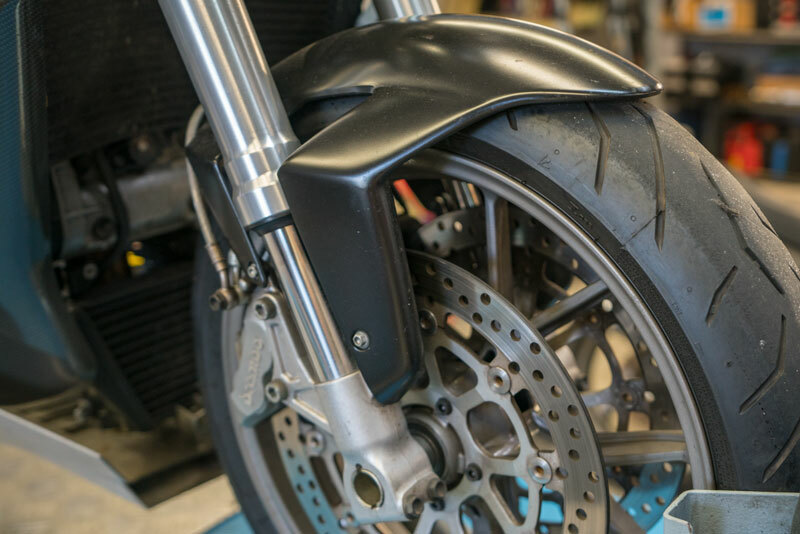 Perhaps you’re fond of a nice neat tail section without a big mudflap? We can do it all… and probably whatever else you can think of. Are your fork seals leaking? Does your suspension seem too stiff or too soft? Chances are you need your forks and/or shocks rebuilt. You also may need to have your forks and/or shocks custom tuned to your requirements. Flywheels has technicians trained to deliver the best possible suspension for the every-day rider or the seasoned pro. 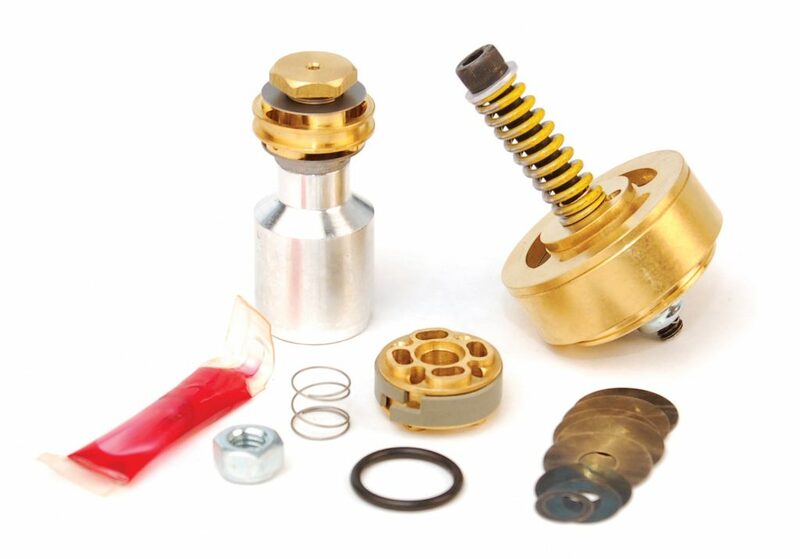 We offer custom gold valve kits and high-quality springs and seals to build the best suspension for your riding demands. 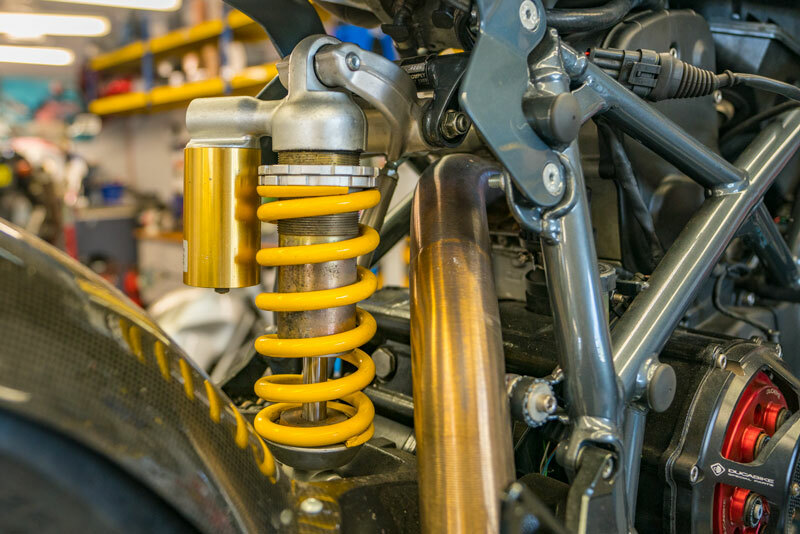 Whether you’re looking for suspension that will handle the most extreme road-race tracks, or a setup that will give you more control and comfort on the way to work, our business can setup the suspension for your specific needs! After a while, fork seals leak. And if you leave it too long the fork oil will end up on your brakes. And you won’t be able to handle the bumps and stop properly when you need to. So a front fork overhaul will see the stauncheons cleaned, seals and oil replaced and reassembled so your bike is suspended the way it should be. A lot of bikes were made for someone who has a different weight to you. We can supply and install the correct springs to suit your riding needs. Conventional and progressive, whatever you need. Actually, this just refers to the colour of the valve as distinct from the yucky grey ones the stock forks have. 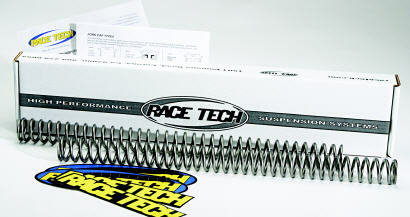 They provide exactly the right high speed and low speed oil flow for your exact weight and your specified riding style. Works a treat. Are you stuck on the side of the road somewhere with no spark? Give us a call and we’ll send someone to the rescue. We can even give you a lift home or to work. Or if you just can’t be bothered riding in for your annual service, we get it! We can offer a pick up and drop off service from door to door, no problem. And if the Flywheels Rescue Ute is indisposed, we can recommend one of our trusty couriers to be by your side, quick as a flash.